Dan Phelps And maybe a few surprises? 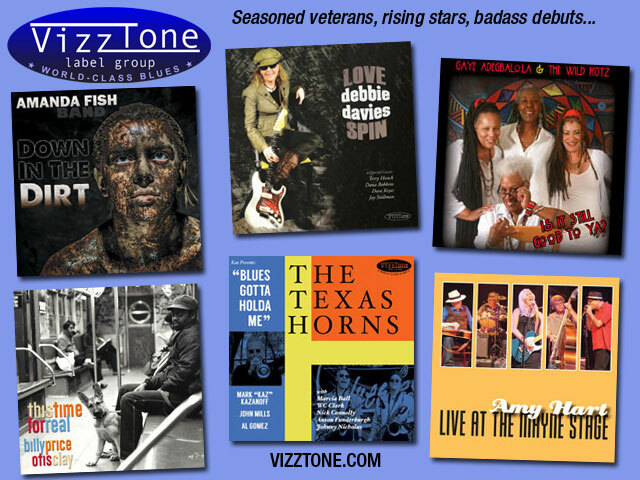 We have 5 music reviews for you including reviews of music by The Peterson Brothers, Ken Tucker, Black Magic Johnson, Joey Flip and Aurora and Daddy Mack Blues Band. 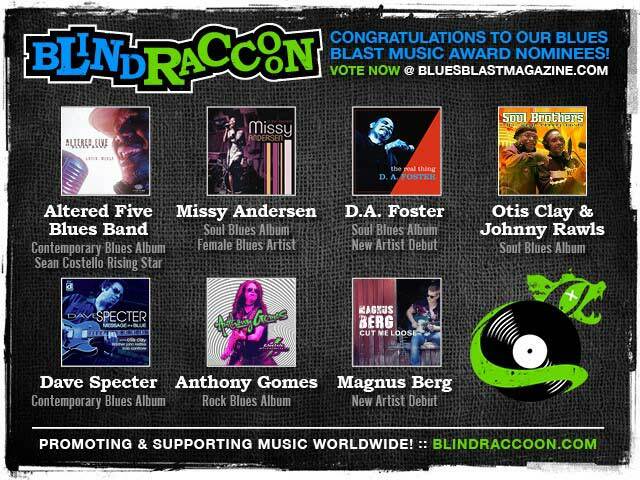 Tomorrow is the big event, The Blues Blast Music Awards! 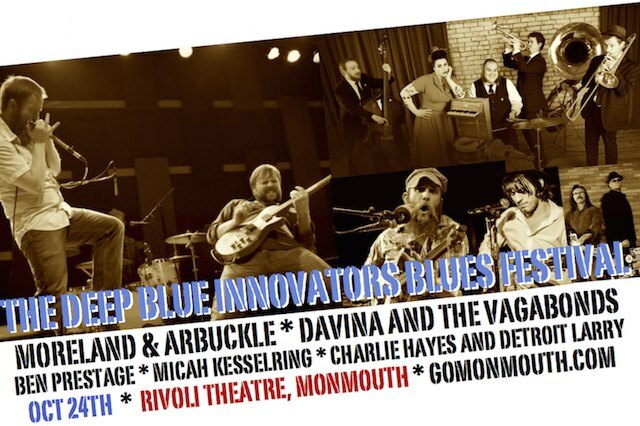 It is going to be a big party as we celebrate the best in Blues music featuring 25, yes count em’ 25, artists performing on 2 stages at the Fluid Event Center in Champaign, IL..
25 performances for only $40! Tickets are still available but hurry as the advance sales stop tonight! Tickets at the door will be $45. Don’t miss it. See you there! I had the chance to catch a couple great Blues performances this past weekend. Candye Kane made it to Springfield , IL for a Sunday afternoon show. Her strength is amazing. She continues to perform in spite of some medical issues because the music heals her! You go girl! Then on Monday night we caught a couple sets by California Bluesman Dennis Jones. We have reviewed at least 2 of his albums in the past couple years but this was my first chance to to hear this awesome guitar player live. I highly recommend catching his show if he comes near you! On the 1980’s parody show Not Necessarily the News, fake commercials were broadcast in between satirical segments. One of these featured a laundry detergent called “New”. A smiling woman listed all the benefits of this novel product, but then another smiling gal interrupted her: “Don’t buy New. It’s old already. Buy New New. It gets out all the dirt that New just can’t get out.” A third smiling lady interrupted the second, extolling the virtues of “New New New.” Get the picture? What is it about our American culture that turns exciting new things so old, so fast? Technology is partly to blame, but it’s not the only factor. 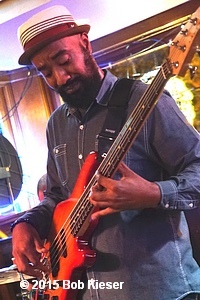 Consider blues music: Up-and-coming younger musicians are confronted with a paradox. On the one hand, they want to sound “new”, in order to attract their Millennial peers. On the other hand, they also want to sound “old”, to be true to the roots of the genre, placate purists, and attract baby boomers and Gen X’ers. How to balance these two styles of blues so that the most people will be pleased at the same time? Enter Texas brothers Glenn and Alex Peterson, presenting their self-titled debut album. Even though there are a few overplayed covers on it (“Amazing Grace”, “If You Love Me Like You Say”, and “I Wouldn’t Treat a Dog The Way You Treated Me”), that’s a small price to pay for forty minutes of classic blues that sounds just as new as anything Kanye West might release. Their vocal talent, keen musicianship, and sharp songwriting skills should put their first CD on radio playlists worldwide. The Peterson Brothers are a bridge between novelty and tradition. On eleven terrific tracks, five originals and six covers, they bring their musical “A-game”. Tracks six and eleven are the same song in, alternately, shuffle and swing styles. 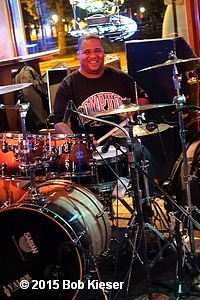 The Peterson Brothers’ band consists of Glenn Peterson, Jr. on lead vocals and guitar, Alex Peterson on vocals, bass guitar and violin, Brady Blane on drums, and James Pace on keyboards. Track 03: “Hey Baby” – The title may be vague, but track three hits the spot when it comes to jazzy swing blues. “Hey, now, baby, what you do to our love? You make me think our love ain’t love at all,” Glenn croons with a touch of flat annoyance. James Pace kills it on keyboards. Yow! Tracks 06 and 11: “I Gotta Go” – Which version of this traditional-sounding ballad is better? Flip a coin, because they’re both great. “The way you used to treat me was oh-so-sweet, but the way you treat me now, it just ain’t neat.” For our narrator, that means it’s time to beat feet. Speaking of feet, crowds will leap to theirs and find partners, especially at live performances. For their second CD, this reviewer’s humble suggestion would be to include lots more original material. 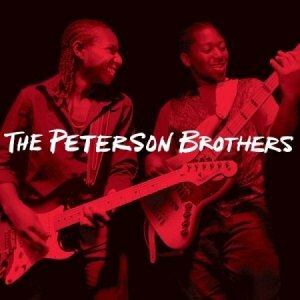 The Peterson Brothers are incredible right off the bat, and need not rely on covers! Look My Way is a very curious release from Ken Tucker: at times outstanding but at other times missing the target by some considerable distance. Featuring 12 self-written blues and blues-rock songs, Tucker has a warm, gravely voice (making the track “Brother Whiskey, Sister Nicotine” all the more believable) and he receives solid support from Virgil Franklin on bass, keys and sax and Russell Tucker on drums. He is also an imaginative guitar player, dialing in a wide range of different tones throughout the album, from the thick, ZZ Top-esque overdrive of “Street Walkin’ Woman” or “Simone”, to the melodic slide of “Look My Way” or the reverb-drenched single coil tone of “Hello Mr. Park Bench”. Further, Tucker at times turns in top drawer solos such as in “What I Need”, where he sounds like an unholy alliance of Billy Gibbons and Carlos Santana. According to his curiously half-finished website, Tucker has nearly four decades of professional experience as a guitarist, songwriter, and performer. Which makes the fact that he released Look My Way in its current form all the more surprising. Undermining all the good points noted above, the production throughout the album is muddy and flat but even that can’t disguise the sloppy playing that surfaces on a number of tracks. Songs like “Nobody But You” suffer from the guitar and the rhythm section playing slightly conflicting rhythms and a number of Tucker’s guitar solos feature missed notes, notes not bent to pitch and licks played off the beat. All of which, of course, can be effective emotional conduits in a blues band. And in a live setting are very common, but not usually noticeable in the heat of the moment. On a more permanent medium such as a CD, however, they can sound jarring and distracting to the listener. And as a result they undermine the good points on the album. Look My Way sounds more like a rough demo than a professional CD release. 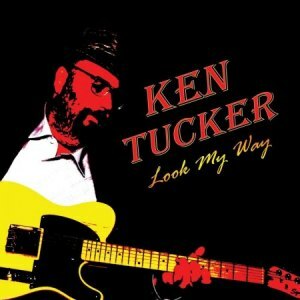 Ken Tucker has the songs, he has the voice, and he plainly can play some fine guitar, but he has done himself no favors with the release of Look My Way. With more sympathetic production and a closer focus on the actual performances, this could have been a very enjoyable album. As it is, it is no more than an indication of potential wasted. Led by drummer, harmonica player and vocalist Reggie Britton, Black Magic Johnson is a tight band from Springfield, Ill., who deliver their brand of blues with an R&B feel. Britton was literally born into the blues, having played in his father’s band as a teenager and he made a name for himself as a youth in drum-and-bugle-corps competitions. He served in the house band on the famous Robert E. Lee riverboat for three years in early adulthood before moving to Central Illinois, where he quickly become the drummer of preference for several bands, including Sun Records recording artist Eddie Snow & The Snow Flakes. The seeds for Black Magic Johnson were planted in the late ’90s, when Britton’s band of the time, regionally popular Oysters Rockefeller, broke up and he started working as a duo with a former band mate. The unit added and changed personnel through the years before the release of their first CD, Call Me, in 2012, but the music they’ve delivered throughout is relaxed, original and built on a solid groove. Sharing credit with Britton on Walk With You Baby are Alex Rogers and Dan Grover on guitars, Lawrence Baulden on bass and keyboards and Willie Christman on bass with a strong lineup of guests, including an appearance by soul-blues guitarist James Armstrong as well as contributions from Springfield-based vocalist/guitarist Tom Irwin, rapper Daryl “Dub I.Z.” Virgina, guitarist Dave Lumsden, vocalist Brooke Thomas, harmonica player Mark Russillo, trumpet player Frank Parker and organist John Crisp. 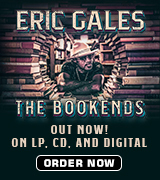 Available through all of the major online retailers and billed as “Americana funky back porch blues,” this all-original CD kicks off with Armstrong laying down a cool guitar groove as Britton delivers “The Call,” a forewarning to a lady of the troubled telephone call she’ll be receiving from him from somewhere on the road. The details are vague, but the feel is real, driven home by Parker’s horn. The pace picks up and the band gets funky for “Magic Man,” a lyrical promise to make a woman’s day better by putting her in a trance. A syncopated drum run kicks off “Can’t Get Over You,” a song of loss in which Dub I.Z. provides a vocal response and brief rap to support the theme. The strong lyrics include the lines: “I feel jaded/My heart’s been confiscated/Sittin’ here by myself and segregated.” Powerful feelings expressed in a unique way. The mood brightens dramatically moments later, however, with the loping “Happy Holiday Baby,” a Christmas tune, before an extended observation about mankind in “Hooked On Something,” a straight-ahead blues that states quite clearly that everyone has some sort of addiction. Next up, “Asleep In The Doorway” – written by Mike Booth and the only song not written by Britton in this set – swings with jazz overtones as it speaks about living on the street and drinking cheap red wine before the slow blues, “Who Dat,” which questions the identity of the person who’s told the listener in the song that her man’s been cheating. Another interesting take on a familiar subject. The title cut, “Walk With You Baby,” features Britton in a duet with Thomas delivered from two angles: he wants to get next to her, and she wants to show you all that she can do. Apparently, it’s a marriage made in heaven because “Thank You Baby,” which follows, is a gospel-tinged, uptempo pleaser. “Good Bye Good Morning,” an acoustic song of parting, concludes the set. 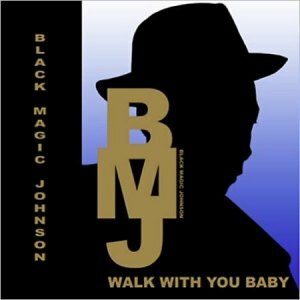 While Black Magic Johnson doesn’t plow much new ground on this album, the band delivers a great set of music here. The pacing is perfect, and the songs all shine. Your ears will have a good time with this one, and your feet will be keeping time throughout. Even in this era of political skepticism, scientific certainty, and “smart” everything (phones, watches, cars, bombs), deep down, many of us want to believe in magic. We know when a magician says, “Pick a card, any card,” we’ll be fooled. The wool will be pulled over our eyes. We’ll be hoodwinked and bamboozled, and what’s more, we’ll love it. We pay to see what we want to see, for that fateful split second when our minds believe the trick is real. Such illusions don’t only happen in crowded auditoriums, on stages with red velvet curtains. Sometimes they occur while listening to music, such as Minnesota’s Joey Flip and Aurora. Their debut Release seems to feature popular covers, such as “Mess Around” and “Whipping Post,” but, abracadabra! Those two are original songs. So are the rest of the ten tracks in this mixed bag of smooth jazz, rudimentary blues, and psychedelic rock. This CD is not for blues purists, but others might find this duo’s musical prestidigitation pleasant. Joey Flip and Aurora certainly give it their all. Their promotional press material reveals that “Joey Flip” Filipovich is “a former door-to-door vacuum salesman turned full-time blues musician. After running a successful sales career for twelve years, he decided to leave it all and follow his dreams in music…He has performed at the Road to Memphis Blues Challenge, the Fine Line Music Café, and other clubs and festivals across Minnesota, Wisconsin and Tennessee. Aurora [Wahlstrom] brings exceptional talent with a jazz background. Her vocals pack a punch and have been compared to artists such as Aretha Franklin and Etta James.” With credentials like these, they’ve made a good start in the blues. Where they finish, however, might largely depend on genre loyalty. They lack specialization. 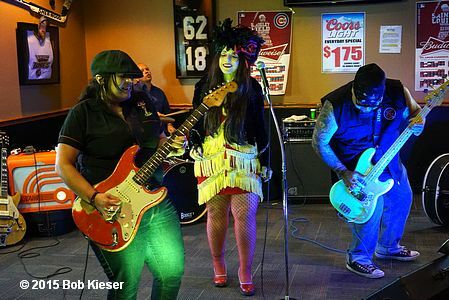 Along with Joey Flip on guitar, harmonica, ukulele and lead vocals, are Aurora Wahlstrom on lead vocals, and the members of their backup band: bassist Ben Tapia, harmonica player Rhona Brack, and Paul Hunder (according to their Facebook page). Track 02: “I Can Tell” – This mid-tempo duet between Joey Flip and Aurora features guitar work that’s as crisp as fresh potato chips, reminiscent of Stevie Ray Vaughan. The contrast, however, between the crispness of Flip’s vocals versus Aurora’s is rather jarring. “I can tell by the way that you hold me tight. I can tell by the way that you treat me right,” the latter warbles, her background training shining bright. “I’ve been watching you, baby, watching you all night long,” Flip literally says beforehand (elongating the “o” in “long” doesn’t constitute singing). Nevertheless, “I Can Tell” track two is the blues – so says yours truly. With all that said, remember this Release is like a prestidigitator performing for the first time in front of their professional peers, making a debut. 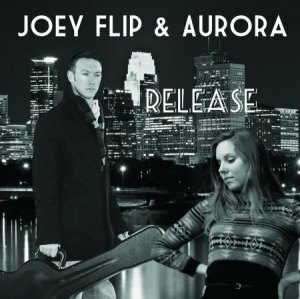 Joey Flip and Aurora may well become master blues magicians, but should make that their primary focus. 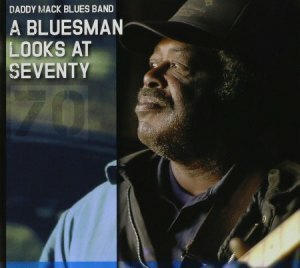 When A Bluesman Looks at Seventy, more than one milestone has been reached. Memphis’ “Daddy Mack” Orr knows this well. For his birthday this year, he has released a marvelously soulful retrospective, looking back on his life – lasting seventy years – and his career, lasting a quarter century if one counts when Orr decided to teach himself guitar. 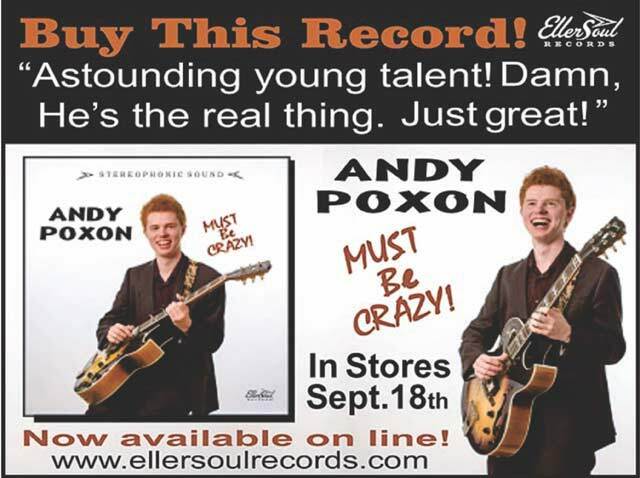 His promotional materials reveal: “Inspired by Albert King and others, he put down some money on a six-string electric at a Memphis pawn shop. He practiced and practiced at his North Memphis home until he got good. Real good.” Such is no exaggeration. “Daddy Mack” is not only the real deal when it comes to Memphis blues, but his songwriting skills are some of the best that yours truly has ever critiqued. A sample of his best lines include: “She loves the way the dollar folds”, and “The colors that fly are ‘Red, White, Blue and Green’” (song reviewed later). 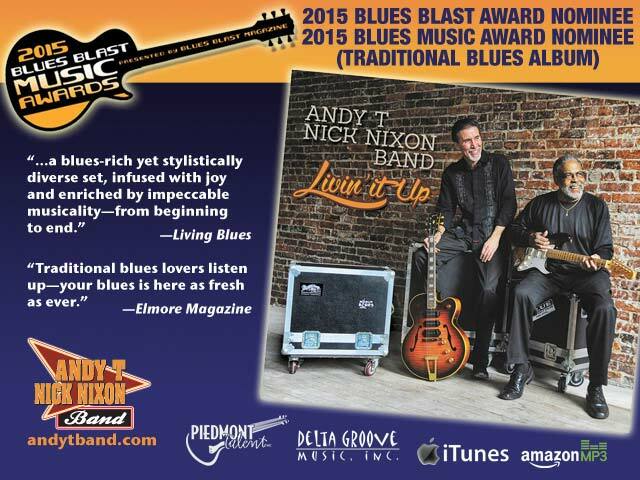 Fourteen original selections, from the course of Mack’s journey in the blues, comprise this hit CD of 2015. 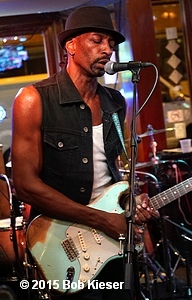 Daddy Mack’s regular band consists of himself on vocals and lead guitar, James Bonner on rhythm guitar and background vocals, bassist Harold Bonner, and Fast Eddie Lester on drums. Joining him are several guest stars: organists Paul Brown, Adam Levin, and Joe Boogie; additional vocalists Troy Isom, Eddie Dattel, Charles Ponder and Nora Tucker; additional guitarists Isom, Matt Isbell, Wally Ford, and Brad Webb; saxophonist Carl Wolfe, Charlie Franklin on trumpet, and percussionist Mike Assad. Track 05: “You Don’t Have to Love Me” – This invitation for a hookup exemplifies our day and age of – well, hookups. “I’m not asking you to wear my ring. You don’t have to love me to make love to me,” Daddy Mack croons, along with harmonious background vocals and additional lead guitar by Troy Isom. Track 06: “Red, White, Blue and Green” – The familiar hues of the U.S. flag may “fly”, but so does the color of money. Some people ‘have’, and some ‘have not’, but “it’s all about the dollar” for all of us: “You take out a loan on the house you just bought, skimp on your taxes, and hope you don’t get caught.” Desperate times call for desperate measures – hence the edgy tone. Track 14: “After All These Years” – Blues can be raunchy or romantic, explosive or slow-swaying, high-octane or mellow ‘essential oil’ for the soul. Track fourteen exposes the softer side of Daddy Mack and company: “Real love don’t come easy, and it’s so hard to find, but these feelings for each other have stood the test of time…We’ve had some heartbreak, but we made it through the tears. We’ve been together after all these years.” Pull a partner close and slow-dance. Joe Boogie plays soft organ throughout. 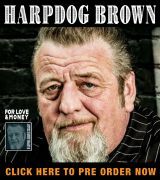 When A Bluesman Looks at Seventy, it’s everybody’s birthday!